Following is the list of six unique floating markets of the West you should explore if you have a chance to go to Mekong region. Nga Bay Floating Market, also known as Phung Hiep floating market, which now belongs to Nga Bay district, was formed in 1915. It has been a famous market of Hau Giang province, and is the site of the trading activities, exchange goods of people in Mekong delta. Additionally, this is also an attractive destination of the tourists. Visitors will be immersed in the endless color of fruits, vegetables, domestic appliances of the river region. Especially, there are the bright red of rambutan, mangosteen, and the flavor of durian. Each boat only sells one type of fruit or item; therefore, it will be hung on a long pole, often called “bẹo tree” as a way of advertising. Nga Nam is the name of the famous market in Nga Nam District, Soc Trang province. It locates in the intersection of five rivers: Ca Mau, Vinh Quoi, Long My, Thanh Tri and Phung Hiep. This is quite a long-standing and also the most bustling floating market in Mekong Delta. Unlike other floating markets, Nga Nam floating market is opened at 3 am, and is busier at 5, but it is closed at about 8h am. Despite standing in a distance, you'll see many kinds of vegetables including cabbages, potatoes, tomatoes, onions, garlics, chili .. dangled in the poles. With about 10,000-20,000 VND, visitors can seat in a boat and see the panoramic view of the market. It can be said that Nga Nam floating market sells most of the products of Mekong Delta, from the famous kinds of rice of the West granary, fruits and vegetables of Southern hick to shrimps, crabs, fish, and typical products of the wetland. The market is crowded with the offer of the merchants, the migratory floating shops such as porridge, noodles, fish noodles, coffee ... which serve the all needs of the visitors. As a famous floating market of Tay Do, Cai Rang has attracted many tourists when they have chance to visit Can Tho. Only about 4 km from Ninh Kieu wharf, it takes tourists about 30 minutes to set a journey from Ninh Kieu wharf to Cai Rang floating market. Like other floating markets, people would hang goods and products thay sell on the poles so that tourists can see and buy. 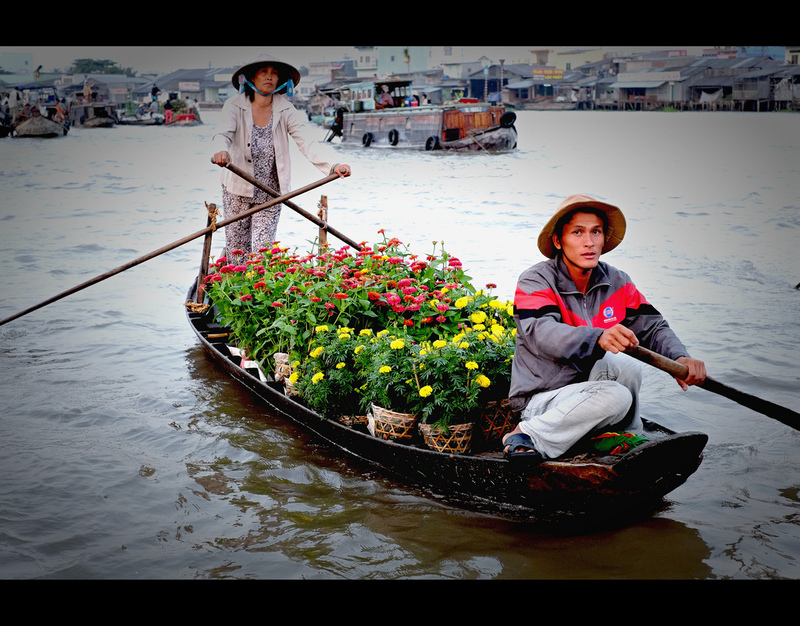 Here, visitors will be immersed with nature, river; float in the boat in the early morning, enjoy the sunrise and feel the unique bustle of floating markets.